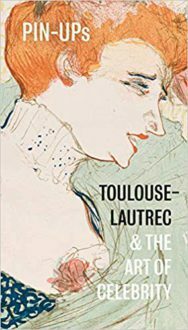 BooksfromScotland are very excited about the opening of the latest exhibition at the Scottish National Gallery celebrating Toulouse-Lautrec’s pioneering work in lithography. His posters from Paris in the late nineteenth-century are now considered icons, paving the way for multiple movements in modern art throughout the twentieth century. The accompanying book explores how Toulouse-Lautrec’s new artistic approach to the poster bridged visual and popular culture, turning the relationship between ‘high’ and ‘low’ art on its head, and highlights how he helped to define the famous hotspots of fin de siècle Paris. 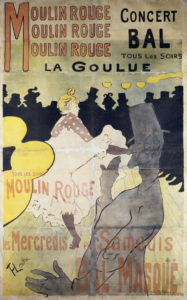 Toulouse-Lautrec is remembered today for his iconic images of Paris’s celebrity élite and his colourful posters of fin-de-siècle Montmartre. It was the music hall and the cabaret that guaranteed his own fame and fortune, and he was quickly accepted into the bohemian demi-monde. He was notoriously gregarious and his passions included food, entertaining, fancy dress and sport. He was also noted for his loyalty, kind-heartedness, charm, intellect and remarkable psychological insight. However, his private story, like that of many celebrities today, was one of a constant struggle with alcohol abuse, self-doubt and, in his case, with the added challenges of physical disability. 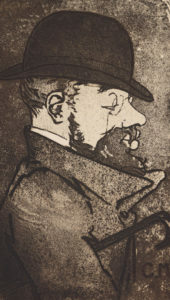 Henri Marie Raymond de Toulouse-Lautrec-Monfa was born on 4 November 1864 in Albi, near Toulouse in south-west France. He was of high birth, descended from three lines of French aristocrats, including the Counts of Toulouse who for centuries had controlled all of southern France. His parents, Alphonse Charles Comte de Toulouse-Lautrec-Monfa (1838–1913) and Adèle Zoë Tapié de Celeyran (1841–1930), were first cousins, which resulted in Henri inheriting serious health problems. He was frequently ill as a child and, most notably, suffered from a rare bone disorder. In his early teens he broke both legs as a consequence of two separate accidents, which left him crippled and halted the growth of his legs. He walked with a cane for the rest of his life and was just four-and-a-half feet (one-and-a-half metres) tall. In later life his physical appearance was often greeted with revulsion: the singer Yvette Guilbert (1867–1944), for example, described being ‘stopped cold by the sight’ on first meeting him. Unable to fully participate in physical pursuits such as hunting, and already displaying a talent for drawing and painting, the young Lautrec took art lessons with a local instructor and family friend, René Princeteau (1843–1914). In 1882 he travelled to Paris to study under the academic painter Léon Bonnat (1833–1922), and later at the studio of Fernand Cormon (1845–1924), where he met and befriended Vincent van Gogh (1853–1890), Émile Bernard (1868–1941) and Louis Anquetin (1861–1932), all of whom were to become leading artists of the avant-garde. 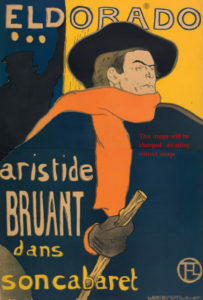 It was during this period that Lautrec had his first taste of freedom, discovering café society and the art of the Impressionists. He soon settled in the bohemian district of Montmartre in northern Paris, where he fully embraced the vibrant and liberated lifestyle. This was an area of the capital where eccentric behaviour was welcomed and encouraged, and Lautrec, who had a regular income from his family, could be found every night drinking and constantly sketching at his favourite haunts: the Moulin Rouge (where he had a reserved seat), the Chat Noir and the Mirliton. Although his few submissions to the official Salon were rejected, Lautrec achieved commercial and popular success during his life­time, and exhibited in independent and solo shows in Paris, Brussels and London. He frequently took the steamer across the channel to England, and was a good friend of the writer and aesthete Oscar Wilde (1854–1900). Indeed, he was a confirmed anglophile and, in Paris, moved in Anglo-French circles, along with the likes of Jacques-Émile Blanche (1861–1942) and Charles Conder (1868–1909). He entertained lavishly and, happier in company, would almost always share his living quarters with other artists. During the early 1890s, he took to spending time in brothels, where he was inspired to sketch the young women’s day-to-day lives. However, his debauched lifestyle, which included regularly imbibing absinthe, a potent drink known for its hallucinogenic side effects, eventually took its toll. In 1897, Lautrec began to show signs of alcoholism, and from this point onwards he became increasingly dependent. His health deteriorated rapidly. Following a bout of delirium in 1899, he was institutionalised at the Folie Saint-James asylum in Neuilly for eleven weeks. Eventually, in the late summer of 1901, his mother had him brought to her estate at the Château Malromé in Saint-André-du-Bois, where he suffered a stroke and died on 9 September, at the age of only thirty-six.